Bonanno’s New York Pizzeria is a casual urban pizzeria offering Authentic New York Pizza by the slice or pie. Can’t handle a slice of pizza the size of your head? Try the Stromboli, Pasta, Salads or Entrée offerings with an ice-cold Draft Beer. And it even gets better! 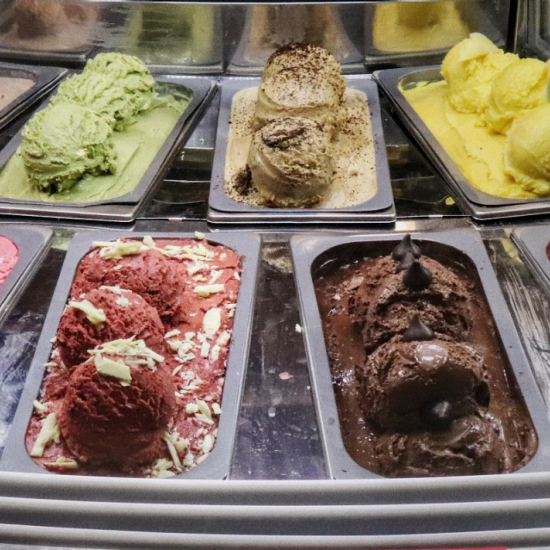 Bonanno’s located at food court is open for breakfast while The Central location serves decadent Gelato! We have 2 Bonanno’s inside the MGM Grand Resort. From the front desk, walk through the casino floor and bear left toward Whiskey Down. Walk past Whiskey Down, The David Copperfield Theatre, and Hakkasan and Bonanno’s will be on the right adjacent to Level Up. Bonanno’s is located near the entrance from the Las Vegas Strip. Once you walk into MGM Grand, take a left passing Hakkasan and you will be at Bonanno’s, adjacent to Level Up.